Tottenham v Liverpool: 25/1 A Goal To Be Scored at Ladbrokes! Ladbrokes are upping the ante on this Sunday's Premier league mouth-watering clash Tottenham v Liverpool! Join via our special links and get a HUGE 25/1 ANY goal to be scored. This bet is normally available at 1/25! What are you waiting for? Take advantage from this amazing Tottenham v Liverpool betting offer! With plenty of attacking talent at both sides (Kane, Alli and Eriksen for the Spurs; Salah, Coutinho and Firmino for the Reds), we are sure that this match will not be a boring goalless draw! Get paid at 25/1 as soon as a goal is scored! And if the Super Sunday match at Wembley ends 0-0, you will get your money back! 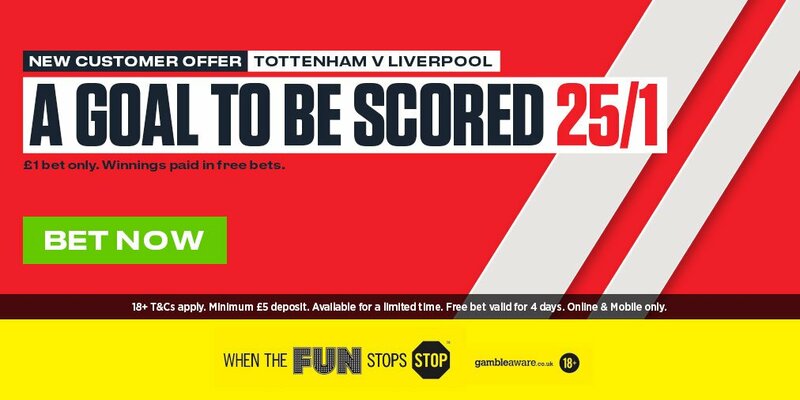 Join Ladbrokes via our special links and claim 25/1 for a goal to be scored in Tottenham v Liverpool! 3) Place a single bet of up to €/£1 on ANY goal to be scored in the Tottenham v Liverpool game before the kick-off. Offer available to new Ladbrokes Online & Mobile customers: Simply register today, deposit a minimum of £/€5, and place your first bet as a single bet of £/€1 on A goal to be scored in Tottenham v Liverpool (25/1). "Tottenham v Liverpool: 25/1 A Goal To Be Scored at Ladbrokes!"